^ Television, 根敦曲吉尼玛 新唐人电视台 New Tang Dynasty. 根敦曲吉尼玛 - 新唐人电视台. 新唐人电视台. [2018-08-09] （中文（中国大陆）‎）. ^ Tibet's missing spiritual guide. BBC News. 16 May 2005 [3 May 2010]. 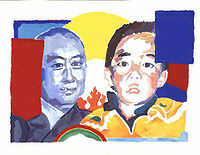 ^ 15.0 15.1 11th Panchen Lama alive, receiving education, says Dalai Lama. The Statesman. 2018-04-25 [2019-02-21] （美国英语）. ^ 達賴指定班禪轉世靈童年滿18歲. BBC. 2007-04-25 [2009-05-13]. ^ 第十世班禅大师的圆寂和遗言. 央视国际网. 2005年4月12日 [2010年5月12日] （中文（简体）‎）.